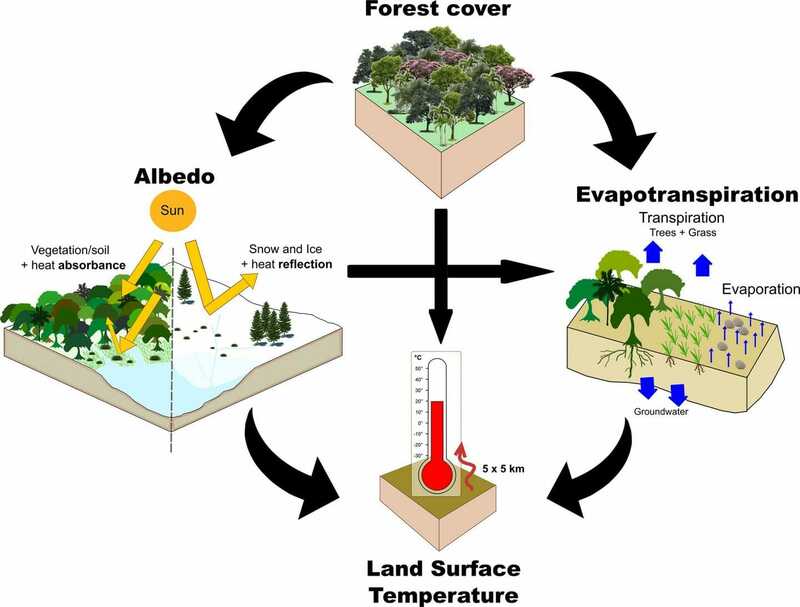 Scheme depicting presumed relationships between forest cover and climatic variables (albedo and evapotranspiration). March 22, 2019 – A new model quantifies how forest change affects local surface temperatures by altering sunlight-reflection and evapotranspiration properties, and predicts that Brazilian deforestation could result in a 1.45°C increase by 2050, in a study published March 20, 2019 in the open-access journal PLOS ONE by Jayme A. Prevedello from the Rio de Janeiro State University, Brazil, and colleagues. Forests are known to reflect less sunlight and have higher evapotranspiration than open vegetation, meaning that deforestation and forestation could affect local land surface temperature. However, until recently there were limited high-resolution global data. The authors of the present study used a global dataset from 2000-2010 to quantify impacts of forest change on local temperatures. They used newly-released data on forest cover, evapotranspiration rates, sunlight-reflection and land surface temperature and built a model to quantify the relationship between these variables for tropical, temperate, and boreal regions. The authors found that deforestation and forestation generally appeared to have opposite effects of similar magnitude on local temperature. 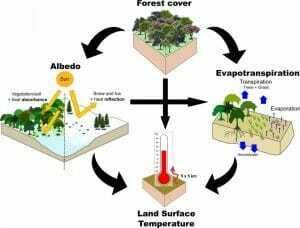 However, the nature of the effect and the magnitude of the temperature change depended on latitude: in tropical and temperate regions, deforestation led to warming, while forestation had cooling effects. In boreal regions, deforestation led to slight cooling, though the magnitude of the effect was smaller. The magnitude of the forest change effects was greatest in tropical regions, with, for example, deforestation of approximately 50 percent leading to local warming of over 1°C. The authors used their model to predict local temperature change in Brazil between 2010 and 2050. Assuming the current rate of illegal deforestation is maintained, this predicted an annual land surface temperature rise of up to 1.45°C in some areas by 2050. However, if no further illegal deforestation occurred, the temperature rise could be far more limited.